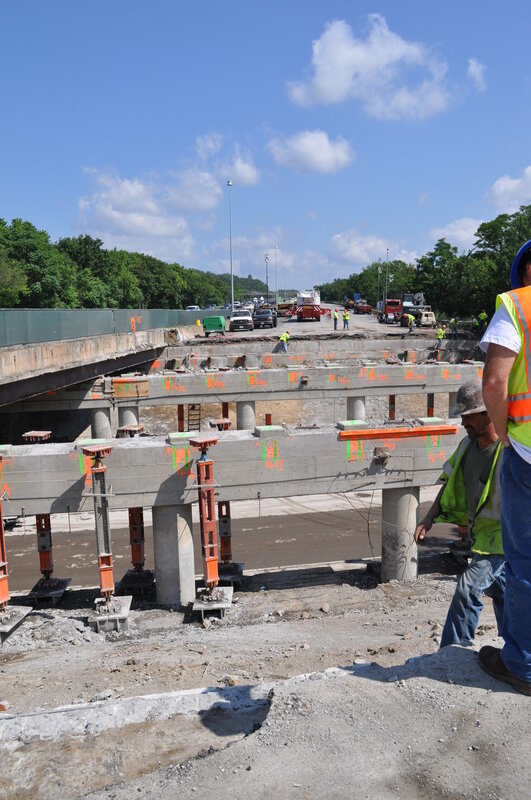 The project involved the replacement of seven bridge superstructures (14 side-by-side bridges) on I-93 in Medford, MA. The existing bridges built between 1958 and 1962 were all steel stringer bridges with cast-in-place concrete decks and hot mix asphalt wearing course. The curb-to-curb width was approximately 70 feet on each bridge. The bridges consisted of four lanes and variable shoulder widths in each direction. Existing vertical clearances varied between roughly 14.1 and 16.4 feet. The project consisted primarily of reconstructing the superstructures of the seven bridges during weekend roadway closures. Other preparatory and follow-on activities were allowed during weekday nights as needed and approved by MassDOT. The construction approach drove the development of traffic management plans (TMP) and required weekend closings of portions of northbound and southbound I-93 in the vicinity of the bridge(s) that were under construction. The reconstruction project began in June 2011, and continued through August 2011. Significant construction activities occurred only on the weekends using Accelerated Bridge Construction techniques. Thus, the seven bridges (14 side-by-side structures) were substantially reconstructed in twelve weekends, excluding the July 4th holiday weekend. The accelerated schedule required that one bridge be demolished and reconstructed each weekend, except during two weekends where two bridges were completed. The contractor set up the work zone, traffic management devices and detours for traffic on Friday evening, worked through the weekend, and opened all travel lanes for the Monday morning commute. The new superstructures consist of steel plate girders with precast concrete decks. 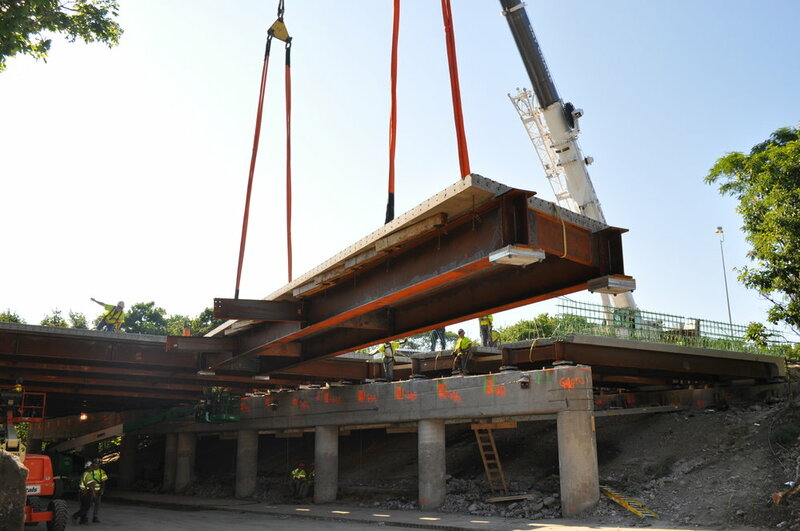 Units consisting of two girders with a precast deck were transported to the site and erected in place during the weekend road closures. High early strength concrete closure pours connected the units together. Due to the tight time constraints for this project, design, detailing, shop drawing review, and review of construction procedures all occurred concurrently. 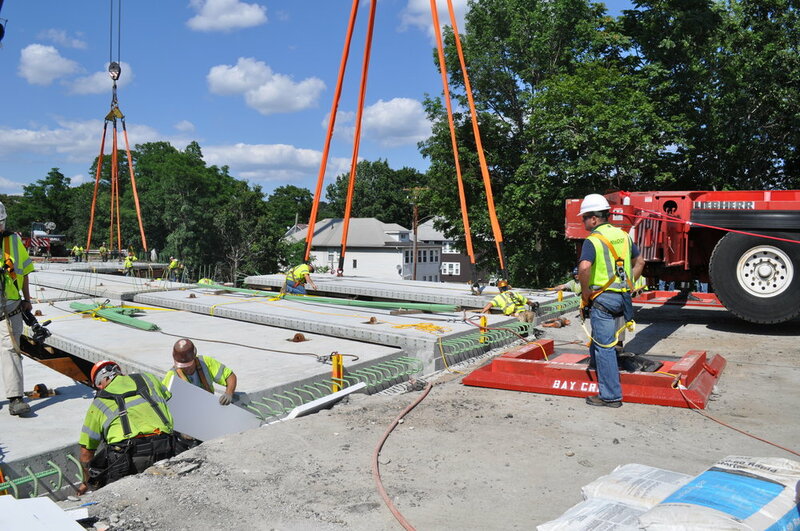 Lin provided the superstructure design of the I-93 Bridge over Webster Street (M-12-028 & 029) and detailed modifications to the existing substructure including new concrete pedestals and transverse shear keys. The bridge over Webster Street consists of 3-single spans. The deck is continuous at the piers through link slabs. Lin also performed the Quality Control Review of the design and details for the two bridges for I-93 over Salem Street.